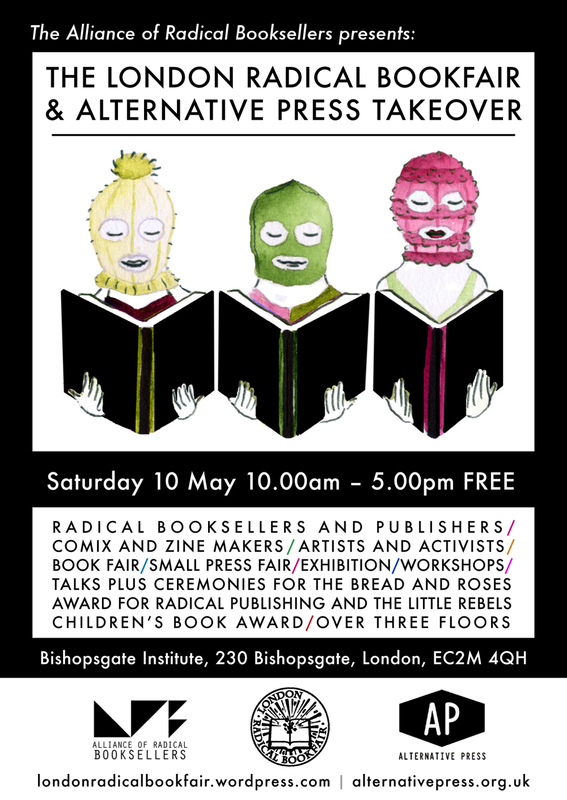 In collaboration with the London Radical Bookfair and the Alliance of Radical Booksellers, Alternative Press will be taking over Bishopsgate Institute. In the first event of its kind, AP will be bringing the small press to a new audience – championing zine-making and DIY alongside radical publishing and bookselling. Spread across three floors, artists will be exhibiting and selling their self published comix, zines, art books, and prints. We aim to showcase the depth and breadth of the U.K small press scene. We welcome all exhibitors – from zinesters, comic folk, book artists, and illustrators; those who use a photocopier or a printing house; have been doing it for years or just starting out. Alongside our small press fair, we will be exhibiting our take on the Bread and Roses Shortlist, as well running workshops on embroidery, radical journalism, and narrative illustration – all details here. We would like to thank both the London Radical Bookfair and Bishopsgate Institute for their support in increasing the reach and archiving small press and zine culture.